Dental X-rays are an essential diagnostic tool that provides valuable information about the teeth and surrounding structures that may not be visibly apparent during a regular oral exam. The need for digital dental X-rays will depend on the patient’s specific dental health needs. Note: Digital x-rays are safe and painless. At Premier Dental Care in Oak Hill, it is our priority to take all necessary precautions to limit patient exposure to any levels of radiation. Use of this technology and practice is standard in the dental care industry. Unlike older X-ray machines that relied on X-ray film to capture images, digital X-rays make use of an electronic sensor that captures images to a computer. These new images can be viewed instantly and scaled (larger or smaller) to help Dr. Bakhtyari and our dental hygienists detect and identify problem areas. Additionally, digital X-ray technology operates at an 80-90% reduction in radiation output. The continued use of dental X-ray images in your regular office visits may help to reveal a number of problematic conditions before they worsen. Our in-house technology is indispensable in the early detection of decay between the teeth, abscesses or cysts, bone loss in the jaw, sub-optimal tooth and root positions, cancerous tumors, developmental abnormalities in the teeth, and other problems inside the teeth or below the gum line. Detecting and treating dental problems with digital X-ray technology saves our patients time, money, and unnecessary discomfort. Dr. Bakhtyari recommends a full mouth series of X-rays for all new patients at Premier Dental Care. These initial X-rays should last for three to five years. 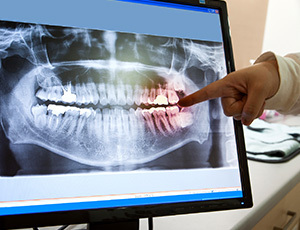 Some additional X-rays (such as bite-wing X-rays) are recommended more frequently to identify any new dental problems.